The artist, John James Audubon led a fascinating life. He was also known as ornithologist and a naturalist. His magnum opus The Birds of America is considered one of the most important book on the variety of birds in America ever published between 1927 and 1838 in Great Britain after being rejected, ironically in America. The book is also one of the most expensive in the world and there are only known 120 copies that survived. One of which was auctioned off for $8.8 million in 2000. Audubon, On The Wings Of The World is an ambitious graphic novel focusing on Audubon’s obsession with the birds in America and his life in general. The graphic novel focuses on his epic journey through America, documenting and painting the birds that consumes his life. There are also heartwarming scenes of his long departure from his wife and children to fulfil his dreams, his rejection by the establishment who don’t understand his works and the profound beauty of the wild as he experiences it. The graphic novel gives an insight into Audubon and utilises the medium of comic remarkably well to tell his story. Fabien Grolleau and Jeremie Royer are able to condense Audubon’s life into different stages and the story is very well written. Artwork wise, Jeremie Royer uses pencils to draw the linework and the drawings are digitally colored. This gives the drawings an organic feel which fits well with the book and the emphasis on nature. The panels are well thought out to keep the story flowing. It engages the reader and makes you want to follow Audubon on his adventures. The chapter pages are beautifully drawn and gives a good sense of what follows next. 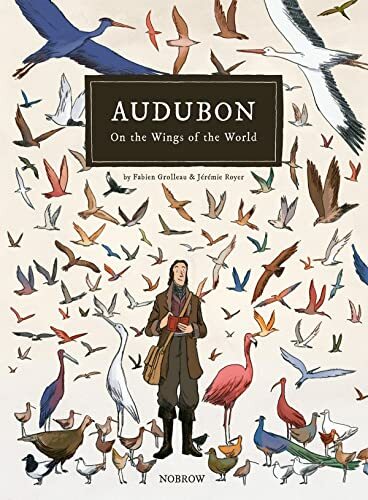 I would highly recommend this book to anyone who’s interested in how a well-told biography comic should be and also a glimpse into the life of Audubon.